Britain's historic vote to leave the EU on Friday has pushed Scotland to seek an independence referendum and raised serious concerns for the global economy. With all the country's cities and towns reporting Friday morning, the "Leave" campaign held a 52 percent to 48 percent lead with more than 17 million votes cast for Leave and 16 million for Remain. As the first member to vote to leave the 28-member bloc, the UK's historical referendum has caused a chain reaction, not only in Britain but also in the EU and the international communities. The referendum, which is not binding but "advisory," does not automatically trigger exit from the EU, which must be confirmed by the British prime minister activating Article 50 of the Lisbon Treaty, beginning a years-long process of exit. British Prime Minister David Cameron said Friday that he will step down in October and "I don't think it would be right for me to be the captain that steers our country to its next destination." There has been no word from other contenders yet on activating Article 50, but EU leaders are pressing for a quick decision from the UK. China's Foreign Ministry said on Friday it respects the choice of the British people but called for the EU to reach agreement as soon as possible since a prosperous Europe is in the interests of all parties. 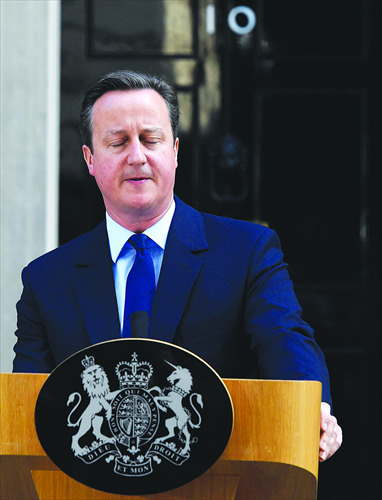 It added that China is willing to keep cooperating with Britain and is fully confident in China-EU ties. "The EU's failing, the EU's dying," Leave campaigner Nigel Farage was quoted by British media after the official results were announced. 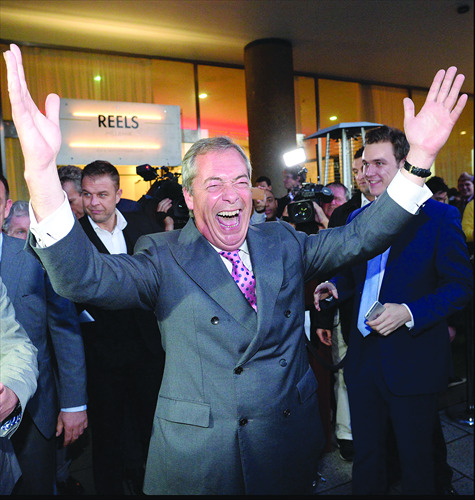 Farage said he anticipates the Netherlands and Denmark will follow Great Britain out of the EU. "It's going to be a very painful process for a while," Professor Tony Travers, LSE London director, a research center at the London School of Economics, told the Global Times on Friday. He added that now the result had come out, the Conservatives will try to repair the divided party and society and "the Conservative Party will probably repair while some of the wounds that have been inflicted wouldn't heal easily and quickly." The Scottish National Party is likely to call for a new referendum on independence from Britain, former leader Alex Salmond said on Friday after England and Wales voted to leave the EU but most of Scotland and Northern Ireland voted to stay. The Northern Irish deputy leader also called for a vote on a united Ireland. "The British government now has no democratic mandate to represent the views of the North in any future negotiations with the EU and I do believe that there is a democratic imperative for a 'border poll' to be held," Sinn Fein's Martin McGuinness, the Irish nationalist Deputy First Minister, told national Irish broadcaster RTE, echoing a position long held by the nationalist Sinn Fein party but vehemently opposed by Northern Ireland's Protestant Unionist majority. Matthew Goodwin, associate professor at the School of Politics and International Relations at the University of Nottingham, told the Global Times, "As a country we are divided. We are divided by social class, generation, and geography. None of these will be resolved overnight." Britain's vote to leave the EU has sparked concerns within the bloc and some leaders of the member nations called for reform. German Chancellor Angela Merkel said that she deeply regretted the British vote and "today is a setback for the European integration process." French Prime Minister Manuel Valls commented that "It's an explosive shock. At stake is the break-up, pure and simple, of the union." Meanwhile, Dutch anti-immigration leader Geert Wilders called on Friday for a referendum on the Netherlands' membership in the EU. "We want to be in charge of our own country ... our own immigration policy," he said in a statement. Wilders' sentiments were echoed by far-right leaders across the continent. US Vice President Joe Biden said on Friday that the US preferred Britain to remain in the EU but respected the result of the Brexit referendum. 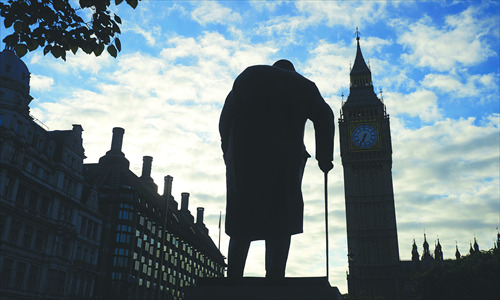 Iain Begg, a senior fellow at the UK in a Changing Europe think tank, told the Global Times that "Many in Europe thought it would not happen, but now that it has. It is clear that this political earthquake will have after-shocks throughout the world." Begg said that the immediate financial instability is only the first of many big challenges for the UK authorities around the future of a divided UK as a trading nation. European stock markets saw sharply lower opens on Friday, falling by as much as 12 percent, and markets worldwide plunged as the vote counts trickled in Thursday night and Friday morning. The British pound fell to its lowest level since 1985, down more than 10 percent at one point against the US dollar, before staging what may be a temporary recovery. Gold and the Japanese yen went up. Most economists predict that the decision is likely to result in long-term economic damage to the UK, and possible recession.